If you’re a foodie who cannot go through dinner without beef steak or Caribbean-spiced pork tenderloin, you’ll definitely need a butcher knife for filleting beef or carving up cutlets of pork or veal. Though a good quality of chef’s knife or Japanese kitchen knife suffices for cutting, slicing, dicing, mincing, and julienning veggies and fruits, a butcher knife becomes indispensable when it comes to dressing cuts of meats. Keeping one in the kitchen relieves you from the hassle of having to use the chef’s knife every time you need to cut or portion meat thereby prolonging the latter’s shelf life. Since the market is flooded with a wide variety of knives each with its distinctive set of features, how to pick and choose the one that best meets your needs and preferences? 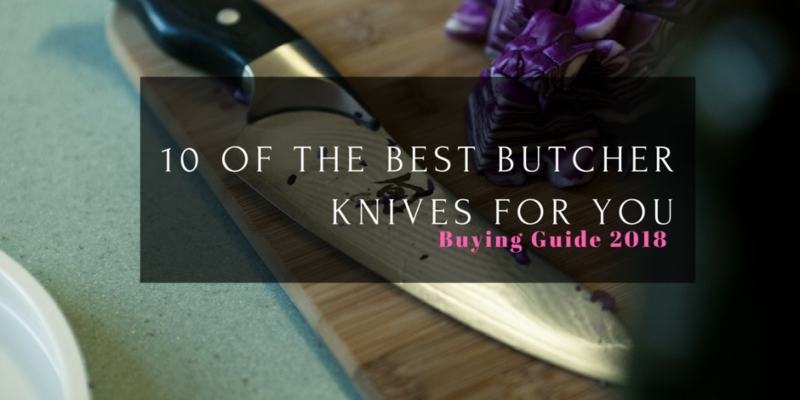 In this review we have listed and reviewed the 10 best butcher knives for your sake so that you can take your pick without squandering time, money, and effort. Victorinox cut its teeth in the world of cutlery more than 130 years back when most other butcher brands did not even exist. Each and every professional chef as well as experienced homemaker worth his or her salt is aware that Victorinox is a brand they can bank upon when it comes to picking up a performance-oriented and durable butcher knife. Take the Victorinox Swiss Army Field Dressing Kit for instance. The kit contains a set of five blades that come in perfectly handy for cutting, portioning, deboning, paring, and filleting large and small cuts of meats and fishes. 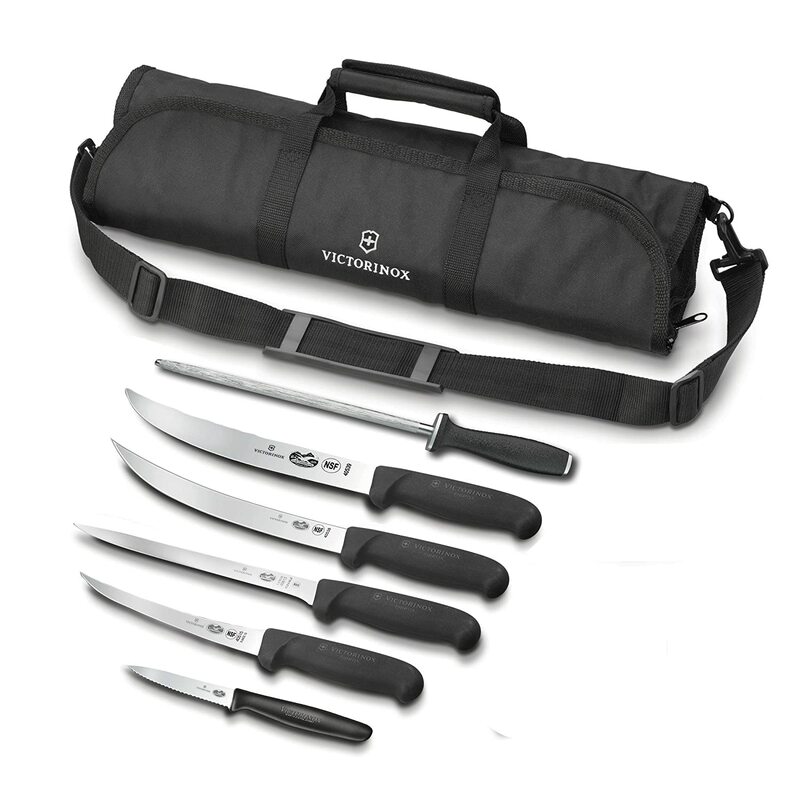 Also included are a 10-inch steel rod with a sturdy and beveled handle that you can use for sharpening the blades from time to time, and a cutlery roll bag for safely storing and carrying the knives. The blades have been fashioned out of premium grade of carbon steel and the finishing has been done in Switzerland by skilled and seasoned craftsmen. The quality of the blade material together with the fabrication and tempering processes imply that not only will the products perform beyond your expectations but also stay functional for years. 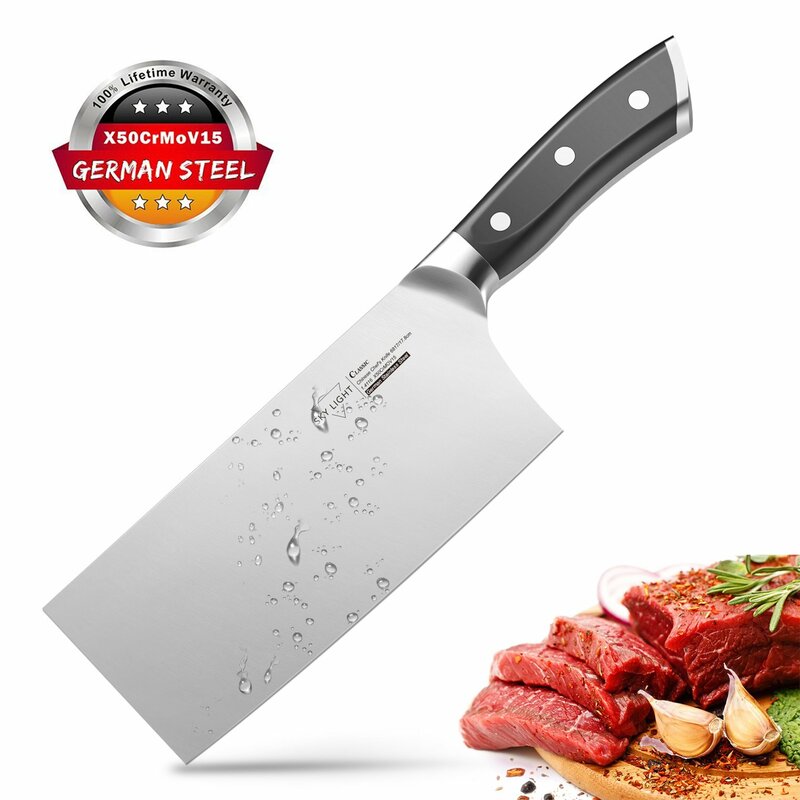 The 10” German Steel Cimeter blade from Update International is definitely one of the best butcher knives that meat cutters, chefs, and homemakers can use for slicing refrigerated cuts. 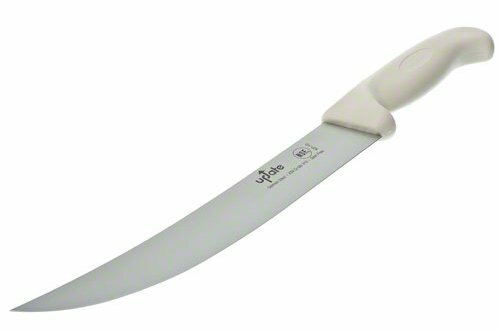 The 15-1/4-inch long blade of the Update International has the perfect heft and the right degree of curvature from handle-end to tip that helps in effortlessly dicing through pork, chicken, snapper, salmon, veal, and venison. This is a full-tang knife which means it can be firmly held by individuals with varying hand sizes and offers a good heft while filleting large salmons, snapper, and other species of fish. The blade has been crafted out of high quality German carbon-steel that makes it extremely hardy and electroplated with molybdenum vanadium that keeps it rust and stain free. The 5-3/4-inch white handle too has been constructed from toughened material and permanently soldered with the blade. Maintaining it is easy as well as you’d just need to rinse the piece in warm soapy water after use and wipe dry with a soft towel. The 7111 Old Hickory Butcher Knife features an incredibly sharp 10-inch blade that can be exploited to the hilt throughout the food processing industry. Professional butchers engaged in abattoirs and slaughterhouses and chefs employed in restaurants will be able to make the most of the heat-treated, high carbon-steel blade for cutting, chopping, slicing, and sectioning meats. The tough and durable ‘Old Hickory’ handle crafted from premium grade of hardwood has been permanently attached to the blade and riveted with brass press-studs to ensure it stays in place. As the blade is full tang, chefs and meat cutters get a solid edge while cutting through meats or removing the skin firmly attached to bones. The high carbon-steel material can be honed from time to time, thus helping you to hold on the knife’s cutting-edge sharpness. The ergonomic design of the handle makes sure that you are able to hold the shaft tightly without sacrificing comfortableness. Also, the hardwood handle adds to the aesthetic appeal of this Old Hickory Butcher Knife by Ontario Knife Co, making the surroundings of wherever it is stored, look graceful. The 10-Inch Straight blade with granton edge and black fibrox handle is another quality cutlery product from the Victorinox house that fully deserves the ‘best’ tag. The straight blade typified by the elliptical granton edges running through the entire lower surface lets you handle the most grueling of butchering and cutting jobs. The supreme sharpness makes the slicing and portioning tasks quite easy even when you dealing with large meat cuts and whole roasts. The blade has been fabricated out of high carbon stainless steel that not only makes the cutting edge hardwearing but also adds to its sharpness. The comicality of the tip or edge of the blade opens it up for performing smooth cuts and wedges. The transition between the blade and the handle is bolsterless enabling you to use the entire length of the blade as well as facilitates in easy sharpening. The proprietary Fibrox handle has been designed keeping ergonomics in mind which boosts firm and comfortable holding. The fine texture of the handle also makes the shaft highly resistant to slippage. The 7” Cleaver, Chinese Butcher Knife with high carbon stainless steel blade and ergonomic handle from SKY LIGHT is surely one of the best butcher knives money can buy. The 7-inch blade has been forged out of premium grade of German high carbon stainless steel that makes it ideal for effectively completing cutting through ribs as well as finishing dicing, slicing, mincing, and chopping jobs. Since this butcher knife is heavier than traditional chef knives, cutting through thick slabs of bony meat becomes much easier. The forging process used for shaping out the blade makes it highly resistant to wear and tear, corrosion, and stain marks. The edging of the knife at 17˚ to the plane enables you to chop your way through pork, beef, chicken, and veal without breaking a sweat. Additionally, the acute angular edging lets you hone the blade remarkably easily. The bolster between the blade and the handle together with the three rivets reinforces your grip and minimizes fatiguing of the fingers while holding the cleaver for a long time period. 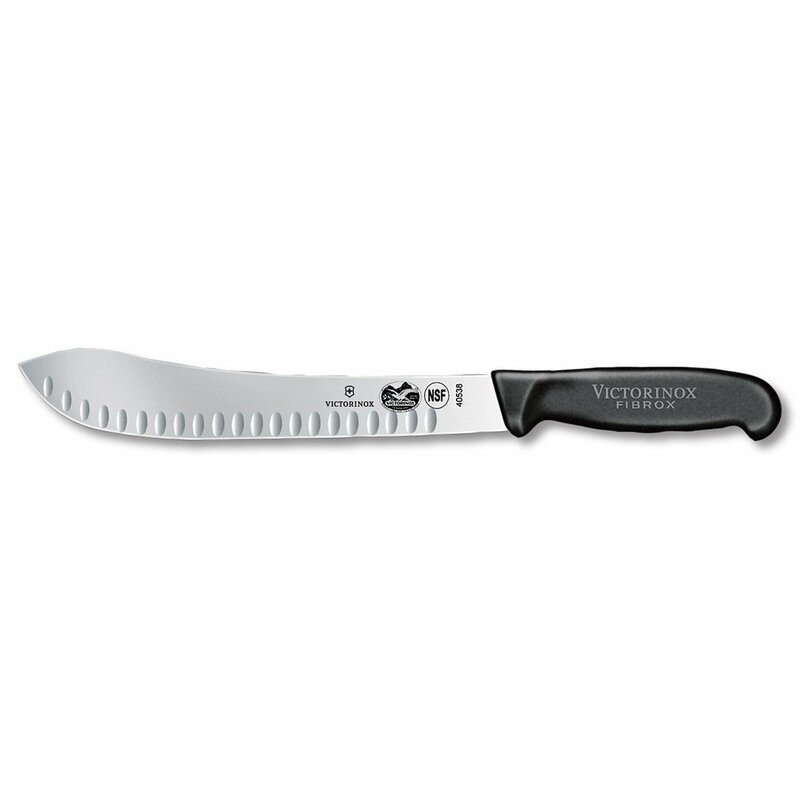 The Victorinox Cutlery 8-inch curved breaking knife with black Fibrox handle comes in ideally handy for those who find best butcher knives with 10-inch or 12-inch blades unwieldy. A seamlessly curved 8-inch long blade permanently attached to a Fibrox handle can be pressed into service when cutting or slicing down large sections into smaller cutlets and portions. The entire blade has been stamped out of high carbon stainless steel produced out of cold-rolled steel which imparts the cutting edge with maximum sharpness. The carbon steel material also helps in retaining the sharpness of the edge for a longer time. The conical edging of the blade contributes to in-depth cutting. The blade material has been ice-tempered to ensure that the sharpness holds for an extensive period. The edge of the knife is without a bolster which allows you to make use of the entire blade and also helps in re-sharpening. The handle shaped out of signature Fibrox material makes it very hardy and its grainy texture checks slippage. The mirrored finish of the blade protects it from corrosion, stains, and normal wear and tear. 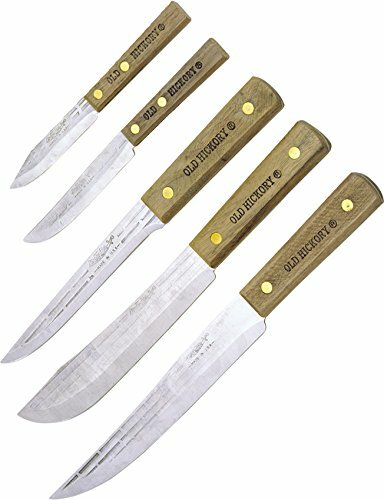 The 5-piece Old Hickory Set 705 from Ontario Knife is highly sought after by the top notch chefs, meat cutters, and cooks. The set of five - one slicing, one butcher, one boning, and two paring blades will come to your aid when you need to cut up, slice, dice, mince, and chop cuts of meat. Each and every piece in the set has been molded out of tempered and heat-treated 1095 carbon steel that imparts extended longevity to them. 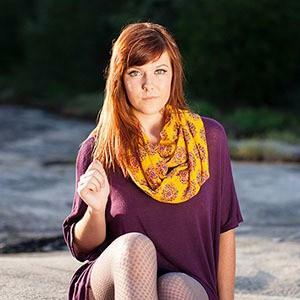 Every part of the set comes with a sturdy and attractive handle made out of hardwood. The handle is firmly tethered to the blade piece via compressed brass rivets. Once the blade and the handle are attached to each other, the blade is given a thorough sharpening so that it takes on razor-edge sharpness. Ontario Co established in 1889 in New York enjoys very goodwill amongst its customers and so you can trust your money on this 5-knife set. The S112-10PCP 10” butcher knife from Dexter Russell is as good as any Victorinox or any premium knife brand, matching the best butcher knives in terms of performance and longevity. 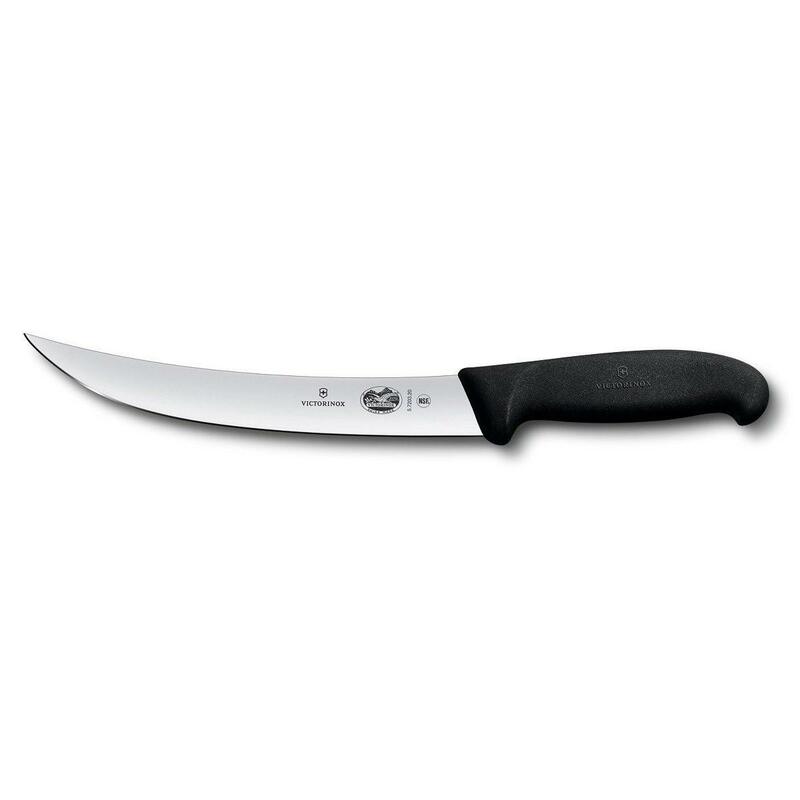 The USP of this full tang, straight 10-inch blade is its pointed tip that helps chefs to butcher meats into desired portions and cuts with relative ease. The blade has been sharpened by highly experienced and skilled craftsman that equips the piece with the capacity to cut and chop through any type of meat. Premium quality of stainless steel has been used for shaping out the blade which will be preferred by those who are put off by the hassle and tedium of maintaining blades made out of carbon steel. Though the piece (the blade and the handle together) tips the scales at .58lbs, the weight is evenly balanced out between the two sections enabling you to grip it comfortably. The patented Grip-Tex handle is very heavy-duty and the textured surface minimizes skid. The 7” professional butcher knife by Chicago Cutlery is a cleaver-styled knife that will come to your aid when or whenever you need to chop, slice, and cut up meats or section veggies in the kitchen. The blade of the Chicago Cutlery cleaver has been fabricated from military grade stainless steel which makes it ideal for processing meats any and every way you want day in and day out. 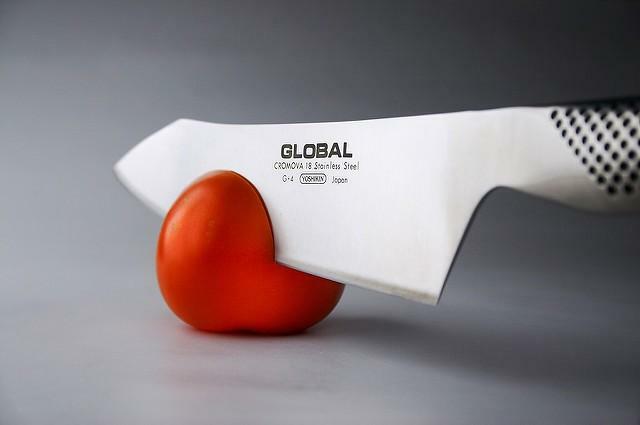 The cleaver knife doubles up as a vegetable cutting knife and as a butcher knife. The hardiness of the stainless steel ensures that the blade remains resistant to routine wear and tear as well as corrosion. The ergonomically designed grip handle permits you to hold the knife for long time periods without causing fatigue to your fingers. 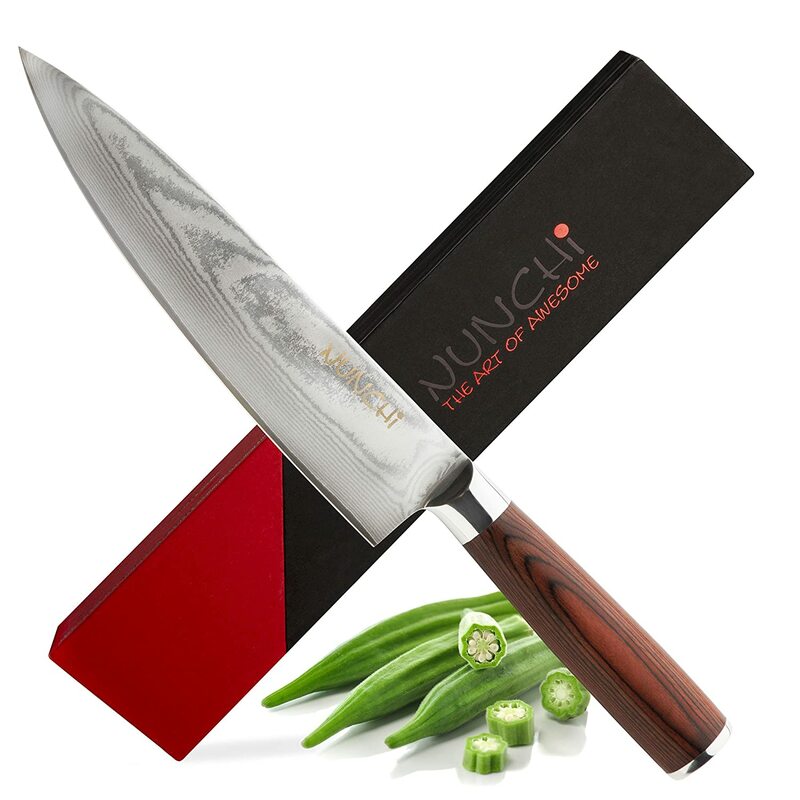 The Nunchi Japanse VG-10 Stainless Steel blade is the perfect companion to any kitchen. While not a typical butcher's knife, the Nunchi has no problem has no problem slicing through tenderloins, soft tissue, thick cuts and even bone if needed. The blade is hardened VG-10 stainless steel that will not let you down even rough and continuous use. The handle is not really ergonomic or comfortable for prolonged use, which is very typical for Japanese knives. Overall, it is a great choice for a jack of all trades type of blade that you can feel confident that it won't let you down when you need it the most. The origins of the humble butcher knife used in domestic and commercial settings can be traced back to the middle ages when Middle Easterners used curved swords better known as scimitars. The scimitar used in the medieval period is believed to be the precursor of the modern-day butcher knife. The best butcher knives find widespread applications not only in catering and food processing industries but also in household kitchens. Butcher knives have broad blades, usually broader than the grip, and tend to be quite heavy and somewhat curved. 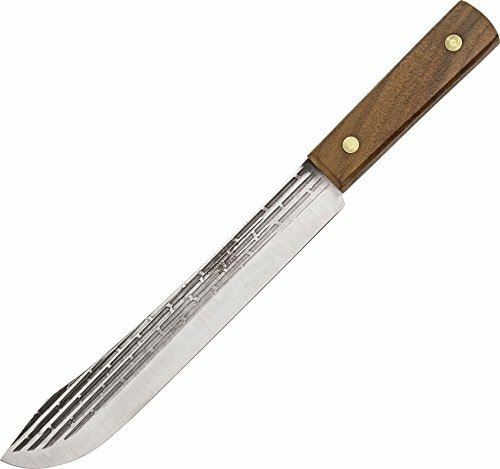 The broad and hefty blade of a butcher knife comes in perfectly handy for slicing, chopping, mincing, and trimming meat portions of different sizes. 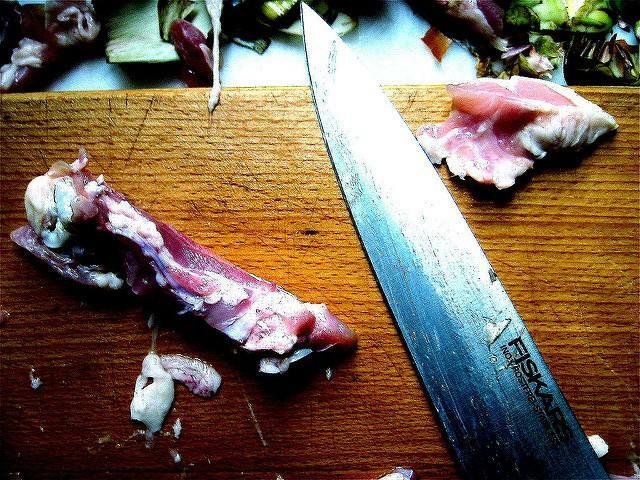 How To Tell A Butcher Knife From A Chef’s Knife? Should You Go For A Stamped Or Forged Butcher Knife? Butcher knives are classified into two broad categories based on the mode of blade’s construction-forged butcher knives and stamped butcher knives. A forged blade is shaped out from a single steel bar that is heated to a very high temperature and thereafter beaten into a desired shape. The forging is either done by a skilled craftsman or by machine. The best butcher knives are usually equipped with forged blades and happen to be pricier than the ones carrying stamped knives. Blades chiseled out of forged steel also tend to be heavier, denser, and hardier than their stamped counterparts. Stamped blades, on the other hand are carved out from a large steel sheet and subjected to heat treatment and sharpened for making these hardy. A stamped blade is lighter and thinner than a forged blade and is directly inserted into the handle without a bolster. The bolster is the connecting point between the handle and blade that serves as a counter-balance as well as boosts the knife’s durability. Forged butcher knives always have a bolster. However, a bolster can be imparted to laser cut or stamped knives as well. The blade material: The blades of butcher knives are invariably forged or stamped out of steel. In this respect, good butcher knives have blades crafted out of VG-10 steel which is a cutlery-grade stainless steel manufactured in Japan. The VG-10 variety of stainless steel has a very high carbon content which makes the material highly resistant to corrosion and stains. 420HC and 440 are two top quality grades classified under the 400 stainless steel series, reputed for their lasting sharpness and immunity to rusting. The handle: The handle of the butcher knife plays a key role in making the cutting and slicing job easier. 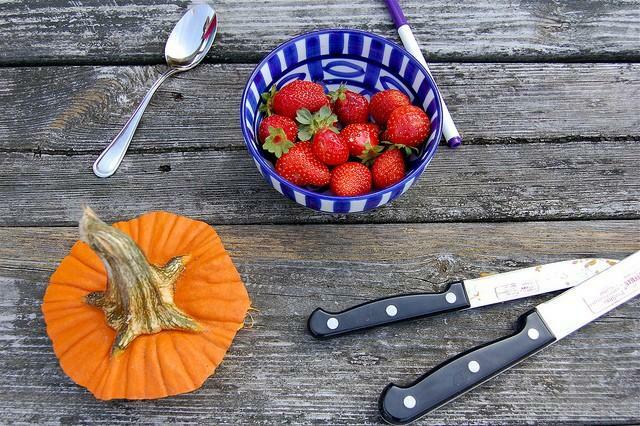 Therefore, an ergonomically designed handle is a must-have for any top grade butcher knife. A handle that has been designed keeping ergonomics in mind will let you grip it comfortably as well as firmly. 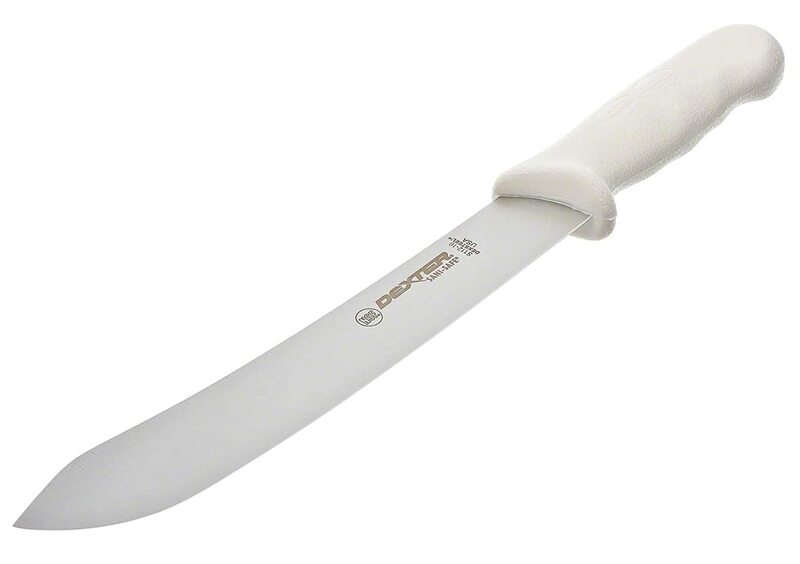 The best butcher knives normally have handles constructed out of plastic that are easy to hold, maintain, and clean. Nevertheless, plastic handles are liable to fracture or crack if the knife if and when subjected to unusually high temperatures. The knife edge: Blades of butcher knives by and large have a straightened, serrated or Granton profile. Blades with a straight edge as the term clearly indicates have no curves and happen to be razor sharp. Granton-edged blades have recessed sections running along the lower surface that help in slicing and mincing tasks. Blades having a serrated edge are suitable for chopping through crispy as well as soft surfaces. Flexibility of use and hardy: A premium butcher knife always happens to be flexible implying that they do not chip or fracture when cutting through tough textures. How Much Will A Best Butcher Knife Cost? Butcher knives are available at varying price points. If you’re looking for a quality butcher knife that performs efficiently yet is affordable, you’ll be disheartened. It is always more practicable to spend a few more dollars in order to buy a topnotch knife rather than choose a cheap one and be compelled to buy a replacement within a short period of time. Closing up, it can be convincingly said that out of the total 10 best butcher knives reviewed in this, the models from Victorinox and Ontario Knife Co. stood out from the rest. Even the Dexter Russell, Nunchi, and Reed Sharp butcher knives made the mark as they had all the features befitting a quality butcher knife.